Multilateral expert discussions in Geneva on ‘Lethal Autonomous Weapons Systems’ are taking place within the framework of the Convention on Certain Conventional Weapons (CCW) in Geneva from 13-17 April. On 25 March 2015, the All Party Parliamentary Group (APPG) on Weapons and Protection of Civilians hosted a roundtable meeting with the UK government delegation to the CCW meeting, as well as parliamentarians, Article 36 and the United Nations Association – UK, to discuss the UK government’s position on fully autonomous weapons systems. Article 36 provides secretariat support to the APPG. Article 36 distributed a briefing note in advance to facilitate discussion. The note collects the UK’s previous statements relating to autonomous weapons and human control, and suggests issues for discussion and areas where the UK could take action to set an example internationally and position itself at the forefront of international discussion on this issue. Given the UK’s stated position that its “operation of weapons systems will always remain under human control”, the UK should support the development of new international law to prohibit the development and use of fully autonomous weapons systems globally. A first step towards this could be to build international consensus around the principle of meaningful human control over individual attacks, which the UK should endorse. There was broad agreement by all at the meeting on the need for meaningful human control over weapons systems and broadly what this entails, including operator knowledge of law and context, and the importance of human deliberation and deliberate action. 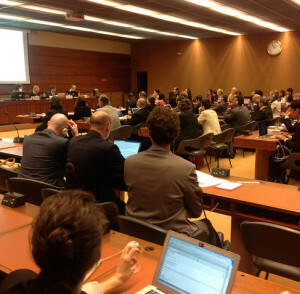 A definition of the concept was requested by the UK delegation, but others emphasised that the endorsement by states of the principle, which could help to build consensus internationally and provide a basis for moving forward, could be more productive than concentrating on a definitional process at this stage. The need to develop a comprehensive UK policy position on this issue was discussed at the roundtable, including the usefulness of strengthening and clarifying certain aspects as identified by the briefing note, and the benefits of drawing existing statements together into one place was acknowledged. The UK government representatives emphasised that the UK does not currently possess ‘lethal autonomous weapons systems’ and has no plans to develop or acquire them. Article 36 stresses the urgency of dealing with the issue of fully autonomous weapons systems and the need to enshrine meaningful human control as a principle in new international law. In addition to weapons reviews processes, the value of which were highlighted by the UK delegation at the roundtable, new international law is necessary to respond adequately to this issue. At the CCW, states including the UK should elaborate the key elements that allow human control to be applied in the operation of existing weapons systems, to support consideration of increasing autonomy in weapons systems based on the principle of meaningful human control.